TAMCO Shield® for hosted or cloud offerings is a financial solution that allows customers to manage cloud endpoint equipment costs just like the cloud service fees, as an operating expense (OPEX) with a convenient monthly payment. Cash purchases and other capital expenditure options for any part of a cloud solution are just counter intuitive to the "X as a Service" model. The Cloud Shield rental term matches the cloud service term to create a complete OPEX solution. 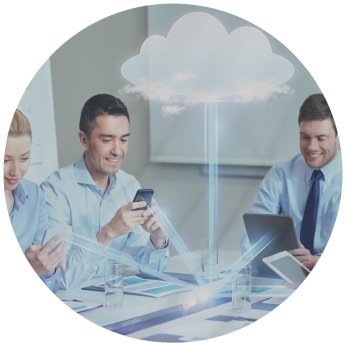 This innovative program takes into consideration business, financial, and technology requirements associated with acquiring unified communications cloud solutions. If the cloud solution no longer meets your needs, you can migrate to a new premise based system at any time. Your existing cloud rental contract is forgiven without rolling over the previous balance or charging hidden fees. In the event of a natural disaster, under Shield, we cover your out of pocket insurance deductible on the damaged equipment. By acquiring equipment as an OPEX you avoid investing in a depreciating asset and keep its associated debt off your balance sheet. Don’t guess how many users you will have over the term. Get the number of endpoints you need now and add as you go. We relieve never-ending contract worries. Add endpoints to your agreement while maintaining the same initial end date. Maintenance support can be bundled into your cloud rental payment to ensure that your cloud system is always up and running. Return the equipment at the end of your initial term or renew the rental agreement (along with your cloud services) and continue to use. Pairing your OPEX cloud network with OPEX cloud endpoints creates a more logical total solution. Connect with TAMCO to learn more about Shield and our partnership programs.